We’d love your help. 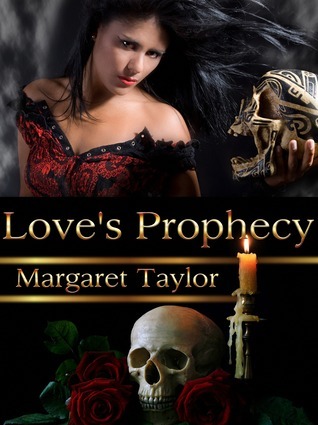 Let us know what’s wrong with this preview of Love's Prophecy by Margaret Taylor. To ask other readers questions about Love's Prophecy, please sign up. Witches, and Prophecies, and Twins OH MY!! What do you do when you absolutely adore an author? You go and hunt for anything else they have written (except for wolf books ... Sorry Ms Tayor even you can't convince me there) and then you see if they need extra reviews ... and if you are VERY lucky they will say yes and send you a copy. Love's Prophecy is totally different from the other series I have read by this author but it still sits nicely in one of my favorite genres. You can tell that this is one of her earlier works, not that that is a bad thing, but it is not quite as polished as some of her more recent writings. The story is addicting and hooks you right from the first page. The characters are strong and the story is magic .....literally. As with most stand alone PR books the romance seems obvious but Ms Taylor certainly manages to throw a lot of twists and turns along the way. A solid 4 out of 5 stars. I love that this was a stand alone but I would be excited to see more adventures developed in this universe even with new characters. Crime solving and spells are always a fun combination! This story is about witches, prophecies, and attraction. A good book with a plot twist, deception, and magic is what is in store for you when you grab this little gem. I am giving 4.5 out of 5 stars for this one. Yes, I am rounding up tonight. It’s well deserved. The characters are well thought out and easy to wrap your thoughts around. Marla is a witch who Austin turns to for help when his twin brother goes missing and he has exhausted all other avenues to find him. The search begins and a proph This story is about witches, prophecies, and attraction. A good book with a plot twist, deception, and magic is what is in store for you when you grab this little gem. I am giving 4.5 out of 5 stars for this one. Yes, I am rounding up tonight. It’s well deserved. The characters are well thought out and easy to wrap your thoughts around. Marla is a witch who Austin turns to for help when his twin brother goes missing and he has exhausted all other avenues to find him. The search begins and a prophecy unfolds as well as desires. There is only one thing that left me wanting just a little more between the three characters. I would have loved to see a tad more of the sparks between them. A little something extra when one of them walked into a room to bring the desires and love to the surface would have been that extra kicker. All extra kicking aside, this one is a winner though. I am looking forward to checking out more books by Margaret Taylor. I really enjoyed the read. I think this would be a great book for a series. I haven’t had the pleasure of reading many books with witches, warlocks, and sorcerers and I am glad to have had the chance to read Love’s Prophecy. Good luck to the author with everything past, present, and future. I wasn't sure what to expect from Love's Prophecy when I first started it. I thought it was just going to be mainly bout witches and other dark forces that, to be honest, isn't my normal type of read. I was soon proven wrong. While this is about witches and dark forces, it's also a mystery and love story all thrown in one. Marla is known to be one of the best of the best witches of her kind. Coming from a long background of witches, her lineage is also known to be the best. Detective Austin Tygris has come to her for some help in finding his twin brother. He went missing 7 mos ago. They were both working in the same case and he got a lead. After going to investigate this lead, he never returned. Believing that The Dark Ones have taken him, he needs Marla's help to hopefully find Max alive. Marla agrees to help, although she knows it will be a struggle. Not just because The Dark Ones are very strong, secretive forces, but because she has such an intense attraction to Austin. Will she be able to overlook this attraction for the time being, or will it distract her in making sure that evil doesn't prevail? I loved this wonderful story of witchcraft, Magic & ghe fight between Good & Evil, and Love. Marla Cortside is Witch & leader of her Coven. She is approached by Austin Tygris, to help find his missing twin brother. Marla is reminded of the ancient prophecy, that tells of twins that can change the balance between Good & Evil. This story is an exciting mixture of Magic & Romance. The characters are wonderful, you really connect with them. I laughed, gasped & cheered them on. I also shed a tear of joy. I really loved this story it was amazing. It had so much happening I couldnt stop reading till I finished. I am so glad I was given the chance to read it and review it for the author. I loved how the story unfolded between marla and austin, it was beautiful. I hate that it was only one book but it is worth the read. I loved how everything flowed together and provided a great story to read. I loved how magic was flowing all through the book and how love won in the end. Marla Cortside comes from a long line of witches. In fact she is the leader of her own coven of seven witches made up of life long friends who work together to protect the rest of the world from the Dark, evil witches, warlocks and sorcerers. So it's no surprise that Austin Tygris seeks her out to find his missing twin brother, Max. He's not a believer himself, but he has exhausted every other avenue and Marla is his last hope. From the very first time they meet there is a powerful pull and attra Marla Cortside comes from a long line of witches. In fact she is the leader of her own coven of seven witches made up of life long friends who work together to protect the rest of the world from the Dark, evil witches, warlocks and sorcerers. So it's no surprise that Austin Tygris seeks her out to find his missing twin brother, Max. He's not a believer himself, but he has exhausted every other avenue and Marla is his last hope. From the very first time they meet there is a powerful pull and attraction between them which leads Marla to believe that they could also be the twins of a Prophecy that has been passed down and Austin seems unaware of his own potential as a sorcerer. This tells her why Max was taken and most importantly, who took him. The Prophecy states that the twins will be the deciding factor of the balance between the light and dark magic in the world since the great awakening brought them both out in the open. So we follow Marla, Jennie, (her second, )Dion, Jerold, Fritz, Wilton, Bambi and Rico of coven seven as they go after Max. This quickly turns from a routine job into a mortal battle to save the world from being ruled by the dark! The action never stops as more and more of the prophecy is revealed and the relationship between Austin and Marla grows into a undeniable romance which may end in a most horrific way and the battle lines keep changing, Betrayals surface, and the future isn't by any means guaranteed as the coven enters into a fight like they have never fought before! A story about twin brothers, a powerful witch and a prophecy that brings them together and could shift the balance between good and evil. Max and Austin are twins and both are cops. When Max goes missing whilst on a case, Austin tries every avenue to find him. As a last resort, he turns up at Marla's magik shop looking for help. Marla is a powerful witch and leader of Coven Seven. As the story unfolds, both brothers are drawn to Marla and Marla to both brothers but she truly loves only one of th A story about twin brothers, a powerful witch and a prophecy that brings them together and could shift the balance between good and evil. Max and Austin are twins and both are cops. When Max goes missing whilst on a case, Austin tries every avenue to find him. As a last resort, he turns up at Marla's magik shop looking for help. Marla is a powerful witch and leader of Coven Seven. As the story unfolds, both brothers are drawn to Marla and Marla to both brothers but she truly loves only one of them. With Witches (good), Warlocks (evil) and Sorcerers (indifferent) abound, there is plenty of magik in the air as Marla, Max and Austin head towards their destiny. This is a very fast paced book. From the beginning, you are dropped into the middle of a situation of powerful magic and forces of good and evil and saving humanity. I enjoyed the story and the writing wasn't bad but, having said the above, I felt the ending did dragged a bit. Maybe there was a word count the author had to met, but I feel there were a chapter or two that could have been eliminated or condense. There was a lot of back and forth and I just did see where it w ACTION. LOTS OF ACTION. Margaret Taylor currently lives in San Antonio, TX and is scratching post for her five cats. She is an avid writer, a novice photographer and enjoys all things paranormal and science fiction! Just ask her, she'll tell you! All In Margaret Taylor currently lives in San Antonio, TX and is scratching post for her five cats. She is an avid writer, a novice photographer and enjoys all things paranormal and science fiction! Just ask her, she'll tell you!